You are well inside an International General Aviation Exhibit! > Modélisme ( 8th Show of General Aviation, Powered Spare Time and Modelling... ). Foreground, the front part of an all-plastic Wassmer tourer and its doors opening as a 3OO SL vintage Mercedes car which was of good interest for visitors. Behind, a SIAI Marchetti S 205-18/R. 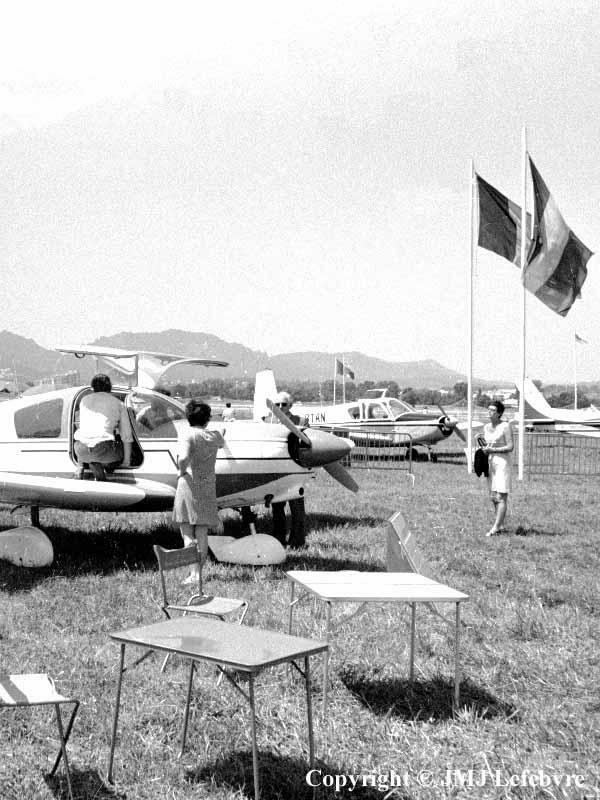 Second part of the 1972 Cannes General Aviation Exhibit required as you know a big lot of work to save pictures. It gives the occasion to introduce my discovery of ground to air photography. Thanks permission to work around the Cannes runway, I got interesting pictures with use of a 80-200mm sliding zoom, more practical than items with a ring, but this one was not of a great optical quality against modern materials. About this, if you have never taken this kind of picture, don't hesitate: frankly buy at less a 400 mm. tele-lens or more. If you have the possibility to be introduced into the works of an lens-importer, you could acquire a 400 mm and a 2x time converter between it and camera. Technicians may adapt perfectly this assembly on your camera or on the one devoted to flying demonstrations. I got this and they also adapted a new 80-200 zoom, all gave me correct results. Also, be very attentive with the infinite point: he has to be exactly at the ring stop, not before because at the stop the good focus is lost...not after before you never reach the good focus. But, with a mirror lens, due to temperature variations, it's quite normal to have a floating infinite but when you are using this kind of material with giant focal length, you already have experience to manage this. Just a word about use of mirrors. I tried three or four different 500 and 600 mm. Pictures got in the street with subjects as people, cars, sculptures and other architectural details into my wonderful Paris were technically perfect. When I took flying aircraft, I discovered with horror a central circle with a different density, clearly visible in the blue of the sky. So I discarded mirrors for that inherent tendency until a friend sold me for a few nuts a true "pressure cooker" size Soviet catadioptric lens of 1100 mm not producing the central defect and being, except the weight of the gold reserve of a central bank, twice larger than a CD disc and delivered with wonderful green, yellow, red and smoked filters ...the whole, except the original companion tripod, in a leather case...It was curious to see my tiny Pentax MEs screwed behind and I remember people more interested by this couple against nature than by aircraft in the sky!!!!! I did only a limited number of pictures with it because weight was considerable and that I never appreciated the use of tripod to take aircraft pictures... Also its chromatic qualities were not famous to do colour slides and, recently, I learned than the Orwo colour films done behind the Iron Curtain were specially studied to give good results with uncorrected tele-lenses produced by the Soviets and satellit countries...True or not ?? ?